MIT asshat economist Jonathan Gruber is back in the news for “problematic billing” in Vermont – a matter now under scrutiny by the state’s attorney general. Gruber, whose claim to fame was predicting that American voters would be stupid enough to support Obamacare, apparently thinks that Vermonters are stupid enough to pay his invoices that amounted to 20-hour workdays. According to the Burlington Free Press, Gruber’s “dubious numbers of work hours” were part of a $400,000 contract that caught the attention of the state’s auditors. It also caught our attention. Never mind that the study was concluded three months AFTER the law passed by Colorado Democrats took effect. 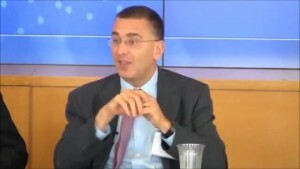 Essentially, Gruber consulted a crystal ball and told the exchange how many suckers Coloradans would sign up for the insurance. According to the Denver Business Journal, Gruber’s predictions stretched through 2016 estimating that 212,000 previously uninsured people would enroll. With only 130,000 signed up after two years of the program, Gruber’s prediction is sadly lagging. So did Colorado get its money’s worth from the study? Gruber’s contract was awarded May 6, 2011 and he submitted his report Sept. 30. That’s about 26 weeks or 105 working days, give or take a holiday. For that, Gruber’s team was paid nearly $3,000 a day. Gruber submitted two consecutive invoices in September and October claiming the exact same figures — 100 hours for Gruber at $500 per hour, and 500 hours for his research assistants at $100 per hour. Only one research assistant worked on the project, according to the auditor’s report. The word we’re searching for here, is “suspect.” As in, Gruber’s billing for work in Colorado is also suspect. Of course, we have no access to view the invoices he submitted to Connect for Health Colorado, but you know who does? Colorado’s auditor. If only the House would get their act together, and PASS THE AUDIT BILL! Gruber just got fired from the Massachusetts exchange board. He's having a tough week.